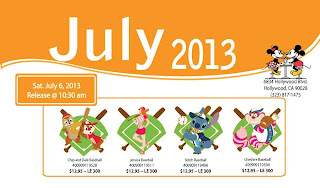 Coming out on July 6th at Disney Soda Fountain and Studio store will be the Baseball Series, featuring Chip and Dale, Jessica Rabbit, Stitch, and Cheshire Cat. Jessica is standing against a baseball field with two bats on either side. She is wearing a red and white striped baseball jersey, and short red skirt while holding a baseball bat. The pins will be a Limited Edition of 300 and will sell for $12.95 each. The Disney Soda Fountain has stated this is only a partial release offering for the month and will update people as soon as possible with the full release schedule.